Denim guru Mohsin Sajid has a lot on his plate. As the owner and creative director of three denim-related businesses—the jeanswear label Endrime, the educational platform Denim History and the denim consultancy 74MMA—Sajid has become a common a fixture at denim industry events, including Denim Première Vision. 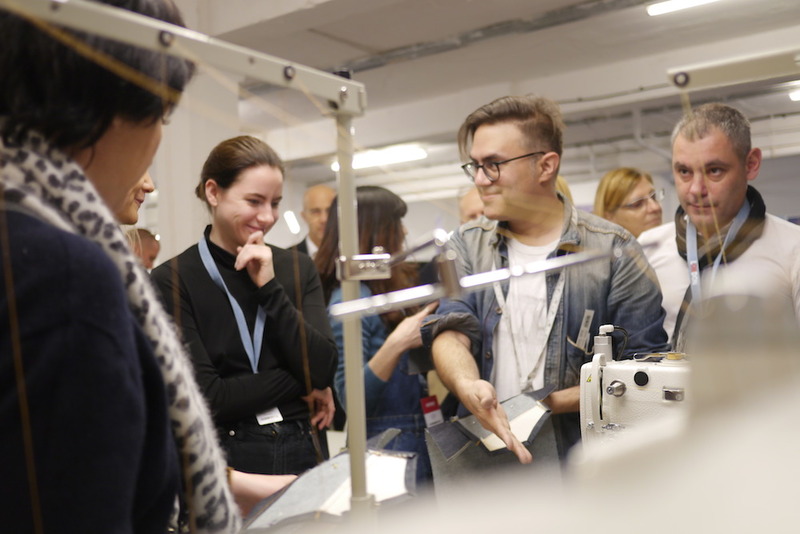 This week at the show’s London event, he hosted four denim-making workshops for attendees to hone their back pocket, J Stitch and front scoop cutting and sewing skills. The trade show was a solid match for the British fashion designer, who graduated from Westminster University before spending the next 16 years bringing his pattern-making and ergonomic tailoring skills to brands like Levi’s Japan, Levi’s Europe, Evisu and his own brand, Endrime. “I have always thought we here in London have always had a strong denim culture with links to great designers past and present. It’s diverse and the best-of-the-world have trained here. London has been a creative hub for decades,” Sajid said. Rivet caught up with Sajid to talk shop and learn how—in his multi-prong role as a designer, educator and consultant—he’s working to encouraging mills, brands and aspiring designers to choose quality and responsible design over fast fashion. Rivet: Tell us about the role tailoring takes in your denim design. Mohsin Sajid: Tailoring and classic selvedge denim styling has always been at the heart of Endrime for the past seven or eight years, but always with a modern touch—with dart manipulation and clean, sophisticated, clever design at the forefront. For me personally, it’s about hidden details and letting the customer find them. We were one of the first to use a one piece fly as standard, and design every style without using an overlocker. We take the same approach with our clients’ work with our denim consultancy, 74MMA. It has always been about tailoring and unique collections for denim mills and factories, and specialist yarn producers. Rivet: What is your favorite fabric and mill to work with? MS: The past 17 years as a denim designer, I’ve been lucky to work and get fabrics from some of the best mills—from Cone Denim, Kaihara, Collect, Kurabo, Orta, Isko, Bossa, Candiani…the list goes on. For me personally, it’s hard to pick from Cone Denim and Kaihara being at the top of my list. I’ve worked with these two mills from the beginning of my career and both are now big supporters of the denim education work I do across 10 different universities. Cone for their natural indigo and duck qualities and Kaihara for the perfect 3/1, which has never failed me. Rivet: What is a common misconception about denim design? MS: Most sales and marketing people think design is easy, and think it’s just a simple case of a cut and paste job, often pushing out designers, thinking they can design collections themselves, without any knowledge of fit or in fact any basic denim knowledge at all. It’s incredibly frustrating to witness. You can’t teach talent, and often you can tell if a good designer has been behind a project, or if it’s been led by a sales or marketing person. Denim is complicated, as you have to design from the fabric, especially when you have a certain wash or finish in mind, and it’s a balancing game to keep within price. I’ve been lucky enough to work for both commercial brands and I my own independent premium brand Endrime. So, I have very much seen both ends of the scale. Rivet: What are you seeing or hearing in the denim industry that motivates you? MS: For me it is sustainability that’s been motivating me. The industry’s been looking bleak for a long time, and recently so many great companies have been really pushing the boundaries and coming up with real solutions, which will dramatically change things for the better going forward. This denim industry is really being led by greed of denim mills, and fast fashion brands, which will in turn destroy this planet. We need to use less cotton—in fact no cotton going forward. And less chemical indigo. In some ways, we should just stop growing cotton immediately, and start using other fibers which use less water. It is the only true sustainable way. For over a decade I have been teaching denim design at many universities, so it’s been really motivating to know a generation of designers I have been teaching already know the mistakes from the past and will opt for more sustainable and creative solutions. Rivet: What is one design tool you couldn’t live without? MS: Sewing machines. In the past 10 years, I have become a specialist on vintage machinery, learning about true 1920s construction, and bringing that knowledge back to the garments I design. I get excited about 3/16″ twin needles and certain shaped bar tacks, and vintage keyhole button holes, to circle bar tacks, it’s endless and addictive…things that modern sewing machine manufactures don’t make any more. I am certain I got some of my biggest denim roles because of the knowledge I have gained from my own 1,000-piece denim archive and my 25-strong vintage machine collection. Rivet: What is your pet peeve about current denim design? MS: My pet peeve the last few years has been designing garments with no hems and raw hems. Don’t get me wrong, there’s a place for it, but I’m happy most women’s wear has reverted back to 3/8-inch chain stitch. There are two things we could all change: First, the rule to have no overlocking inside garments. I give zero marks to any student I teach if they use an overlocker. And two, the re-introduction of the continuous one-piece fly in all fly construction methods. Not only is it cheaper to do in production, its less fabric and looks better and less bulky. Since 1947, everyone has been pretty much following the same way we make jeans—the cheap mass produced way. If you just look 40 to 50 years earlier, you see more tailored garments, which is what early workwear was all about. Rivet: What will be some key skill sets for future denim designers to have? 1. Basic and good knowledge of men’s and women’s fits and shapes—past and present. 2. Strong pattern cutting skills and the ability to understand 3-D shapes and convert them to 2-D, and vice versa. 3. Ability to communicate with others and work well in a team. 4. Good understanding of fibers and denim constructions, and the spinning and dying manufacturing processes. 6. Deep understanding of sewing machinery. 7. Deep understanding of 1840s to 1870s to mid 1950s workwear. 8. F**k cotton and start using linen, hemp and Tencel going forward.